2002 season - about 350. 2003 season - about 450. 2004 season - about 600. 2005 season - about 550. 2006 season - about 550. 2007 season - about 600. 2008 season - about 650. 2009 season (up to May 3, 2009) - about 150. 2011 season - about 1500. 2012 season - over 1700. 2013 season - almost 2000. 2014 season - over 2000. 2015 season - over 2100. 2016 season - over 1900. 2017 season - over 1800. 2018 season - over 1800. The Early Warning System implementation for OGLE-IV is very similar to its OGLE-III version. OGLE photometric data pipeline is based on Difference Image Analysis (DIA) photometry (Alard and Lupton 1998, ApJ , 503, 325, Alard 2000, Aston. Astrophys. Suppl. Ser. , 144, 363, Wozniak 2000, Acta Astron. , 50, 421). DIA photometry ensures better quality photometry in dense stellar fields compared to the classical approach with the profile fitting photometry. Currently 51 OGLE-IV Galactic bulge fields containing about 300 million stars are regularly observed for microlensing and analyzed by OGLE-IV EWS: color marked fields in this map. See also the OGLE-IV Galactic bulge map for details. 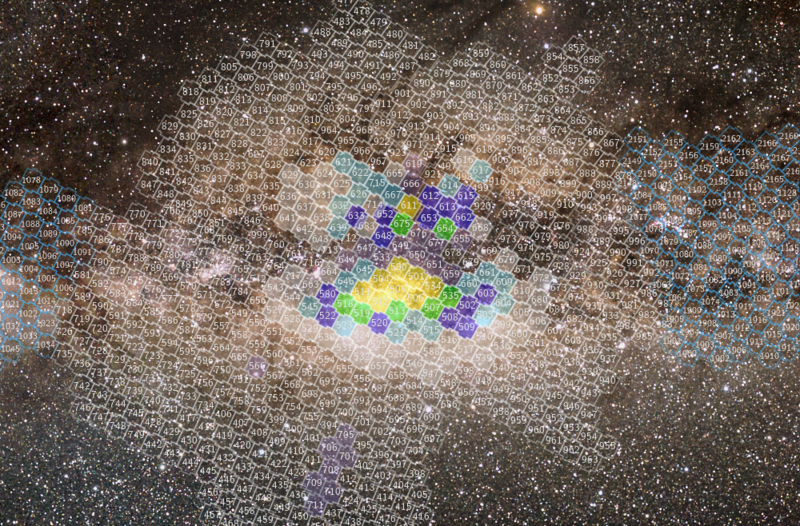 The EWS analyzes photometry of all stars in the field and flags a star when it is detected in the difference images four times in a row. For microlensing event detection only objects increasing brightness are marked. Initial filtering masks the objects which were detected in difference images during the previous observing seasons (3-10% of all stars in the frame) to avoid false signals by variable stars. The light curves of flagged stars are inspected visually, their positions on the recent CCD frames are checked for bad pixels, bleeding columns, very bright neighboring stars etc. If a star passes all these checks, it is announced as a microlensing candidate. The second detection channel of microlensing events is based on objects stored in the OGLE databases as new objects, that is not registered as stellar on the reference images. The source stars of these events are usually below the standard threshold of stellar detection. Microlensing candidates from this channel can be recognized by letter N at the end of star number and are also described in Remarks record. One has to remember that we cannot guarantee that all alerted stars are indeed true microlensing events. However, our experience from the previous years ensures that the number of false alerts should be relatively small. So far, the EWS system has detected 535 candidate microlensing events in the 2019 observing season. The table given below provides interactive WWW access to the finding charts, photometry data and other information about all events. Currently ongoing events are marked with . Particularly interesting events are marked with . Microlensing events data can also be found on Anonymous FTP. There is also a mailing list providing on-line notification on the detected events. Astronomers interested in follow-up observations and willing to receive e-mail notification, should fill out subscribe/unsubscribe form. If you have any questions or comments, send us a message. I0 - base (minimum) I-band magnitude for lens. The OGLE-IV interference I-band filter very closely reproduces the standard system. The photometric data are, however, not calibrated. They were just shifted to approximate the I-band system magnitudes. We estimate that the difference should not be larger than +/-0.1 mag. The data will eventually be calibrated but this will not happen soon. Star numbers within the field are also likely to change, because we plan to re-run photometric data pipeline on all the collected data when we have more good frames to replace our current provisional reference images (time scale of a few years). However, our "lens" notation, e.g., OGLE-2011-BLG-0001, will be kept for good. Please note that due to expected number of microlensing detections exceeding one thousand the event numbering in OGLE-IV consists of four digits. The most RECENT and PREVIOUS updates of the OGLE-IV microlens database containing lens IDs and recent photometry. The OGLE EWS photometry is provided here for informative purposes only to facilitate the microlensing community monitoring the on-going events and follow up observations. Please contact us if you want to use the data for publication. We may require to be co-authors when our photometry is important for analysis or refuse its usage if we are currently working or plan to work on the event. When referring to the OGLE EWS system, please cite the paper by Udalski et al. 2015, Acta Astron. , 65, 1 and provide the WWW address of the EWS system or the OGLE WWW home page.